Bruce Ismay, the head of the White Star Line was worried. The Olympic, his brainchild to recapture the lucrative North Atlantic passenger trade from Cunard, had been seriously wounded. She was due into Belfast the next morning, October 6th, 1911 for "repairs". But he, and everyone else, knew that she was worthless and could never carry on her business as before. He approached Thomas Andrews (Managing Director of Harland and Wolff, the builder) with a cunning, daring plan. Switch the Olympic with the Titanic (currently under construction), scuttle the "Titanic", have the passengers saved, claim the insurance money, and save the White Star Line from an impending financial disaster. Ismay and Andrews had enjoyed a sumptious meal at the White Star Liner's owners palatial home: sat in his leather upholstered chair, a fat cigar protruding from the corner of his mouth, a whispy trail of smoke ensuing. Ismay swilled a glass of brandy as he asked Andrews what he thought of his plan. Andrews stood in front of Ismay, his face white with surprise. He was simply astounded. "Don't you realise, sir, that public confidence in the White Star Line would be forever destroyed if the ship were to ram an Iceberg?" "But Andrews," said Ismay between puffs on his cigar, "It'll be an accident. No-one will be to blame. Oh, of course the officers of the watch may face some probing for not avoiding such an accident, but I think the White Star Line will be, as we say 'off the hook'." He took a generous swig of brandy, the hint of a smile and an enquiring gaze on his face, as he waited for Andrews response. "But Andrews, its the only way. Olympic can't sail again - but we can make money out of a catastrophe." The conversation continued thus for hours, Ismay wearing down Andrews under the condition that no lives would be lost. Ismay pledged his word. "Alright," said Andrews, still not happy with the plan, "then its simply a matter of logistics; men, equipment, supplies to make the switch feasible." Ismay slapped the arm of his chair, his voice rising to an excitable squeak, "That's it Andrews! What kind of things did you have in mind?" Andrews paused for a minute or two, gazing into the warm glow of the fireplace, as his mind poured through his mental notes of the construction and out-fitting of both vessels. "Well, the obvious ones are the name plates. If we can get new plates ,the names cut in, and then switched, then that will be the first step." "Good," Ismay said between generous puffs on his cigar, "What else?" "I'm thinking of all the changes and differences between the ships. You recall the B deck promenade on the Olympic and how on the Titanic this would be passenger cabins?" "Well, we've just about finished on the external and internal layout of the modifications. So, all that will need to be ripped put and transferred to the Olympic, er, I mean Titanic." Ismay sat forward. "How hard would it be to switch these cabins?" "I don't know," sighed Andrews, "we've never done retrofitting like this before. It might not be a big job. I imagine its all a matter of time." "Well, I want 'Olympic' to resume her Atlantic run as scheduled for November." "That means leaving here about November 20th to get to Southampton in time for the loading of provisions etc." Ismay did some quick arithmetic, "Well, she dry-docked on October 11th so thats 40 days. That should be enough, surely?" Andrews nodded, trying to placate his customer. "You can divert some men to do the modifications? You have 15,000 men?" "Quite true, Sir, but we are performing work on other ships for other lines, and, if you remember, we are due to be laying the keel for the Gigantic in November too?" "Oh yes," Ismay sat back dejected, "I forgot. I could always delay the maiden voyage for the Titanic, er Olympic, from March 20th to April 10th. That gives you three weeks." "That will help of course. A lot of that time will be used performing repairs on the Olympic/Titanic and keeping reasonably to schedule with the construction of the 'Titanic', to prevent anyone's suspicions being aroused about delays etc." Ismay sighed. His plan was starting to come together. "So, what needs to be done to make this switch convincing?" "As you know, Sir, the two ships differ significantly in construction, and not just B deck. For instance, the carpetting and floor tiles are different in colour. So every one of them will need to be changed to keep up this story." "I have faith in you, Andrews" beamed Ismay. Andrews pretended to smile. He didn't like his hard work for Ismay being belittled and abused in such a manner. "The Turkish bath area on the starboard side of F deck is different in layout. And then theres the front of the wheelhouse. In the Olympic, its curved, but on Titanic, its flat." "The bridge and officers quarters needs changing too. On Olympic, the wireless cabin had an outside window, but this was changed on Titanic to allow more seaward facing cabins to be included, There are quite a few other changes too." mused Andrews, his mind racing through his mental blueprints. "Titanic's lifeboats and davits aren't due to be fitted until later on in the year, so we'll need to transfer the whole lot to the Olympic, er, Titanic"
"Splendid!" beamed Ismay, "And you'll have to change the nameplates on them of course." "But of course," Andrews managed a sickly grin. He paused. "I've just had a somewhat worrying thought. Just about every piece of wood on the ships we build has the builder's number written on the back to identify which ship the piece was intended for. We'll need to remove the woodwork from the ship and alter the numbering, in case anyone checks." "All of it?" Ismay erupted "Do you know how much wood there is on the Olympic?" Andrews did know. "It sounds arduous, but I believe its necessary. What if someone checks in decades to come? Or what if theres a major refit, or repairs are needed." Ismay wasn't very happy. This would eat into his schedule significantly. An uncomfortable silence descended upon the room. Andrews mind sprung into life again. "What about sea trials?" "What about them?" Ismay muttered clenching his teeth, dropping ash into his lap. "Olympic ex-Titanic wouldn't have had any. I wouldn't like going to sea without testing her." "Dash it all! That would give the game away, man!" Andrews sulked. "And by the way, how do we get away with this without 15,000 Irish men coming forward and telling someone?" Ismay sat back in his chair; "Now THAT, my dear Andrews, is a good question...."
Comment: Of course, the above never happened. But it is amazing the rubbish that can be created by a fertile imagination. For interest, the Olympic as scrapped in the 1930s and many of her fittings wound up at auction, and can be found at places such as the White Swan hotel in Alnwick, and, until recently, the Crown Paint HQ in the North of England, The wood pannelling has the number "400" inscribed on the back - the Olympic's yard number (Titanic's was 401). Another worthwhile web resource, written by noted maritime author Mark Chirnside, can be found at this link. Robin Gardiner's agent also joined the fray, but in a most unprofessional manner. His abusive posts on the Encylcopedia Titanica website were sadly deleted, but his venomous spiel is there for all to see in the Fortean Times Forum - look out for posts by "Storyman", who subsequently stormed off in a sulk, returned, insulted everyone, stormed off, returned and was ultimately banned and henceforth his identity reverted to the default moniker "Anonymous" (see the original thread here). Unfortunately many users in that conversation has since departed (such as Bruce Beveridge, also listed as "Anonymous"), or been ejected so it is hard to know who was "Storyman" in that thread (believed to be Graham Smith, Gardiner's agent, who had also researched the loss of the hull trawler "Gaul", convinced that she and her crew were lost due to submarine involvement - which is contrary to the findings of an inquiry which put its sinking due to bad weather. Smith's Mediaworld website was behind the Titanic Conspiracy website). Incidentally, don't believe what Storyman says about Robin Gardiner's one-time writing companion, Dan Van Der Vat, viz. "Dan Van Der Vaat now agrees with Robin Gardiner" (December 9th 2004). In emails to me in early January 2005, Dan describes the switch story as "bilge". "You have a very unpleasant, and totally untrue, comment on your web site about myself and Robin Gardiner in connection with Dan Van der Vatt. It is you sir who is guilty of spouting "bilge", and if you have any manners you would remove it. You will notice that Robin and I now take little interest in the attacks from you and those of your biased ilk, but I do object to unjustified personal attacks." I should mention that the quote from Van Der Vat is genuine, and that Robin Gardiner did email me, promising proof of the Titanic "switch". He has failed to provide this, but later went on to produce another book on the subject. So what can be said of this ludicrous switch theory? Superficially, on the face of it, it appeals to the amateur by invoking authoritative sound bites that seem convincing. And no one is going to check up on the proferred "facts" especially if the evidence sounds compelling. It is much easier to accept the arguments than spend hours verifying the data. What would the White Star Line have to gain by deliberately sinking one of its own vessels? Nothing. It hardly instills confidence in the travelling public when a widely touted "unsinkable" ships founders on its maiden voyage. The marketing and sales impact would be horrendous. And scuttling a ship like the Olympic is a ridiculous notion. A few years beforehand, another White Star vessel, the Suevic grounded on the coast of England due to navigational errors whilst in fog. The bulk of the ship was pulled off the beach but the bow section remained. So what did the White Star Line do? Did they write off the ship? On the contrary, a totally new bow was built in Belfast, shipped to Southampton and reattached to the remaining stern. Repairs of such a magnitude were not beyond the ingenuity of Harland and Wolff. And the shipping magazines of the period have occasional references to vessels that had undergone massive overhauls. 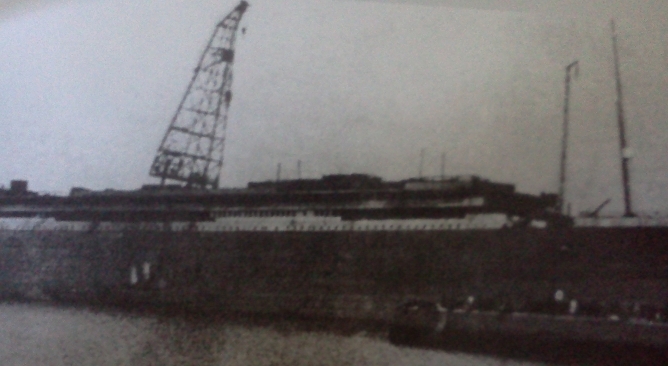 In one, a ship was cut in two and a new mid section added to lengthen her, a new funnel being added in the process. So, the Olympic-Hawke collision was a major situation, yes, but not beyond the capabilities of the repair teams of Harland and Wolff. Let the Switch Theory rest in peace, R.I.P. The red area indicates the forward half of the 1st class A-deck promenade being enclosed with retractable glass screens; the Olympic's promenade was open all the way along. The green area on the Olympic is a regular arrangement of windows on the B-deck 1st class promenade, but on the Titanic, this was converted to cabins, and the arrangement of windows altered. Needless to say, any "switch" theory would have to incorporate all the extra cabins on this deck being switched to the Titanic/Olympic. The blue area is the 2nd class promenade area. On the Olympic, this ran for the last quarter of "B deck", but on the Titanic it was massively truncated to extend the 1st class restaurant out to the port side, and on the starboard side, the cafe parisien was included. A small point: the porthole on the D deck gangways (denoted in yellow) was round on the Olympic; on the Titanic it consisted of two vertical rectangular windows. The purple areas indicate the bridge wings (forward) and the aft docking bridge (stern). On the Titanic, these extended over the ship's side by a couple of feet. On the Olympic, they were flush with the ship's side. And most obviously, the white boxes show the ship's name plate, incised into the hull (I have omitted the name of the stern). To change the ship's name was not simply a matter of prising out a few plates or painting over the old name. So, for the switch to work, what would need to be done? We have, unfortunately only a smattering of information and photos with which to work. We can't say for sure what needed to be done, and over what time period. But we may have enough. The photo above was taken in early September 1911. As can be seen, most of the sliding windows on B deck have been removed, in readiness for the conversion from promenade to 1st class cabins. One can see the Olympic in the graving dock, and in the foreground, with only one funnel fitted, is the Titanic herself. It is not known exactly when this photograph was taken; blow-ups of the starboard quarter do not show the temporary wooden plug above the waterline that was fitted for the journey from Southampton to Belfast. It is speculated that the Titanic was moved out of the fitting out quay, to allow the Olympic in for inspection; if so, this would be between October 7th and the 11th. As "Titanic In Photographs" says, "Due to the damage and flooding in her aft compartments, Olympic was down at the stern and spent several days at the Wharf being 'considerably lightened'. 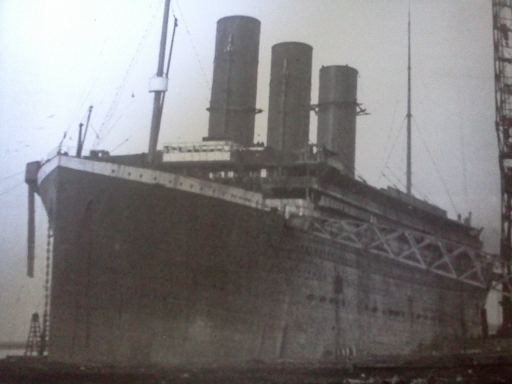 Olympic was finally moved into dry dock on 11 October 1911." Now, at this point, the Titanic's lifeboats and davits were not installed; neither were her anchors (although they were temporarily fitted for her launch). It's unclear what condition the ship was in, but a newspaper article describes how a lot of the installed fixtures were already in situ. But that article only goes up as far as "C" deck, saying that the framing for 1st class stateroom is "in hand." The Manchester Courier and Lancashire General Advertiser (19/10/11) states that the electrical turbine and auxiliary and other machinery and all the boilers were on board, the funnel uptakes were complete and one of the funnels and both masts had been erected. The article only says that "accommodation is very far advanced." The Dundee Courier of the same date says that the refrigerating plant and steering gear had also been installed. The Derry Journal (27/10/11) is more detailed: in addition to the above items, the 2nd and 3rd class accommodation aft on the lower deck was well advanced, whilst on the middle deck the middle deck bulkheads were finished throughout, work was also proceeding on the Engineers accommodation. The stateroom bulkheads on the upper deck were also practically complete, and were well underway on the saloon deck, where the 1st and 2nd class dining saloon and 1st class reception room joinery grounds were all up and and ready for proceeding with the framing, panelling and ceiling. On the shelter deck, the 3rd class smoking room and general room joinery grounds had been finished and the framing of all the 1st class staterooms on this deck was well in hand. The main staircase was also in position and work in connection with the elevators was advancing speedily. What needs to be done? Obviously, three of the Olympic's funnels needed to be removed to match the configuration of the Titanic. The paint needed to be removed from this, all future funnels as they didn't receive a coat till much later on. A funnel in the White Star colours being seen on the Titanic (ex Olympic) would be suspicious. The two newspapers mentioned above make no mention of the recicprocating or turbine engines having been installed yet in the Titanic's shell. So, these would need to be installed, or transferred from the Olympic. This not a trivial task especially in the few weeks remaining. And all this needs to be done with no-one the shore seeing this, and wondering why the funnels were being moved around. How was this movement of stacks to be done? On the left is a contemporary (c.2012) satellite photo of the Thompson Graving ("dry-") Dock where the Olympic was being repaired, with a graphic of the ship in place. The photo of the Titanic in early September 1911 (above) shows a massive floating crane which was used to lower machinery and funnels into place. It would have been a simple matter to move this crane into location in the River Lagan (the waterway to the left of the Graving Dock) and, once the guy wires and securing posts on the sun deck removed, pluck the funnels one by one, moving them to the "Titanic" further up the river? Kill two birds with one stone; while the hull was being patched up, take the funnels off, saving time? Unfortunately, no. The crane had a radius of 100 feet, and the closest distance from the edge of the quay to the Graving Dock is approximately this distance. When you factor in the extra 50 feet needed to get to the Olympic, parked centrally in the dock, and the fact that the crane's boom's pivot point was not flush against the quay, then we have a probable distance of over 150 feet from crane to the Olympic. The only way to extract the funnels was to (a) drain the Graving Dock once the hull was been plated. (b) move the Olympic out of the dock and then (c) pluck the funnels off. Draining/filling of the dock took 100 minutes, and moving the huge steamship would have been cumbersome. Once out of the dock, the crane could be used to re-install the funnels on the other ship. Goodness knows how long this would take. Then the workers had to worry about interfacing of the piping between the Olympic's funnels and the Titanic's upper decks, to ensure that all tubing and connections matched up. They may also have taken the time to change some of the vents on the boat and sun decks at this point, as numerous changes between the two ship's configuration had been noted over the years. And no one on land noticed this! 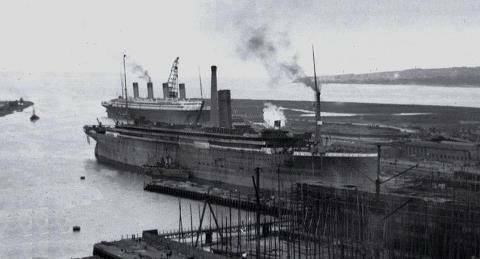 As you can see from the following photograph of the Olympic in the graving dock, shipyard operations were visible from public areas for miles around. Thousands of people in Belfast would have seen the switch operation - and yet there is not one word in the papers of reporters or photographers rushing out to find out what was happening, take pictures, elicit quotes from people at the yard etc. By 10th November, the first two funnels on the Titanic (ex Olympic) had been transferred. Again, the funnels would have to have been stripped of paint. The Olympic's (ex Titanic) B deck would have to be re-installed, and because the Titanic (ex Olympic) was now to have suites where this promenade would have been, the window re-arrangement would have to have been performed on this ship now, as it had been for the Titanic before the Olympic arrived. And all the above between October 7th and November 20th. 44 days. Now, some of this could be performed by moving furniture and fittings from the completed ex-Olympic to the new Titanic, but this would still require a lot of work to make the ex-Olympic fit for sailing, which would take place 6 months and 10 days after the Hawke's collision, or 5 months and 20 days after the Olympic was dry-docked. Unfortunately I do not know the state of completion in the ex Titanic. 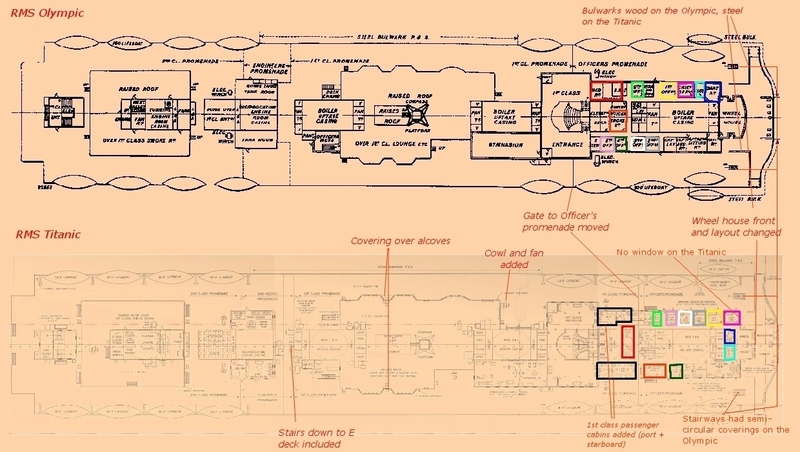 For instance, the officer's quarters were very different between the two ships (see below), and if the Titanic's layout had been completed by October 11th, then the walls would have had to have been stripped out and repositioned. This seems like a very large job. But, if this was done after October 11th (which was the first opportunity to start relocating fixtures) then the Titanic's officer's area would not have been touched yet and this could be left for another day. Similarly for the large number of extra rooms on B deck, but here there was a simple solution. If the indications from the "Titanic's" wreck are any indication, the partitions between the new staterooms were made of wood (which has since rotted away), a much easier material to deal with than steel bulkheads. All one had to worry about were the electrical and plumbing connections to the new B deck cabins. This was taken after December 6th, when the third funnel was fitted. Notice how grimy the ship was! The hull colours used at launch would not have been permanent and rust and detritus would build up. Repainting of "this" ship was still some months away, and in the meantime, a grey lead primer would have been applied to the ship's hull above the waterline. But consider how grimy and filthy the "Titanic" (ex "Olympic") had become in just a few short weeks...and then also consider how the "Titanic" had but a few short weeks to be painted to match the near pristine paint work of the nearly new "Olympic" when she arrived in Belfast in early October, 1911. But wait, didn't the Olympic return to Belfast on another occasion...? Indeed she did. In late February 1912 on the return to England, the Olympic threw a propeller blade in mid ocean, necessitating a return to Belfast; she arrived there on March 1st and was dry-docked the next day. Repairs were completed on March 4th, but the Olympic remained in the Graving Dock due to heavy winds. The Olympic left Belfast on the afternoon of March 7th, and she is reported to have arrived in Southampton the next day, and her next voyage was on 13th. 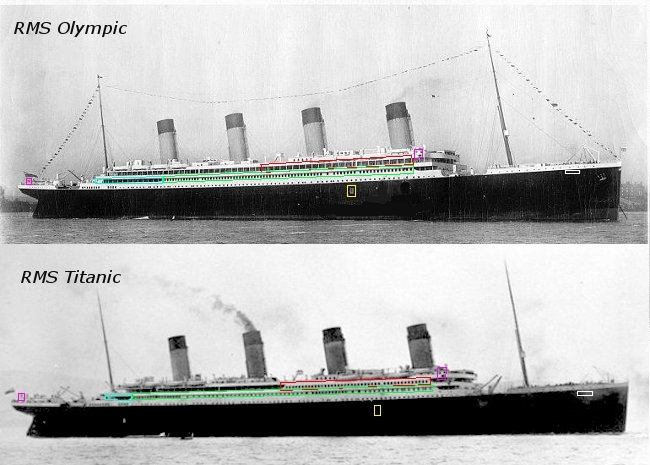 Could the Olympic and the Titanic's fittings be switched in this short space of time? Remember that with work on the Titanic nearly completed, there would be no need to swap funnels and so on, but we are left with only about 4 days in dock at most to exchange all the fittings. I would confidently posit that there simply wasn't enough time to do this, especially with the huge differences to "B" deck. Below I present an analysis of the major differences between the two ships (excluding such small details as the drinking fountains for the crew, a Titanic-only feature, we are told). Apologies for the faintnest of the Titanic' plans. When analysing the layout of the boat deck, a number of changes are evident. Most of these are minor, but the arrangement of officer's cabins is now very different. To show the differences in placement, the cabins have been colour coded. On the Olympic, only the Chief, 1st and 6th Officers are on the starboard side; on the Titanic, all the officer bar the 4th and the Captain are located here. The Marconi room now goes from an outside room to in an internal one, meaning that it loses it window. 1st class cabins are included at the rear of the officer's quarters. The officer's smoke room goes from being internal to the starboard side, offering a view of the boat deck. The Captain's lavatory and bath room, just aft of the navigating room and the Captain's sitting room (the only two rooms other than the officer's lavatory etc. to escape a change of location) now seem to be much smaller, to allow room for the 4th Officer's cabin. On the port side, where there had been 4 rooms forward of the entry to the boat deck, there are now 5. This is to allow the 1st class cabins to be included. On the Titanic, there is now a port-to-starboard corridor in front of the elevator gear (just in front of the 1st class grand staircase). 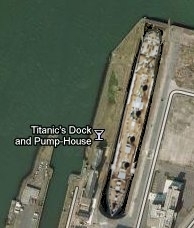 Also moved were the pilot's and the chart room, which, on the Titanic were directly aft of the bridge. Researcher Roy Mengot also claims that the "skid lights" on the Olympic were oval; on the Titanic, they were round. These lights were windows mounted close to the deck, at about shin height, to allow natural lighting into cabins on A deck that would otherwise have no windows. A minor difference is the wooden teak trim which on Olympic follows the contour of the bridge cab inner wing curve. On the Titanic it does not follow the curve and is only evident on the horizontal portion of the forward bulwark. On the Olympic, the outward edges of the bridge wing cabs were flush with "A" deck; on the Titanic, they overhung slightly. This feature was later incorporated into the Olympic during her refit in late 1912. Bob Read also advises that the cowled sirocco ventilator on the forward starboard corner of the third funnel deckhouse was oriented differently between the two ships. There are other, relatively small differences, most notably the "mystery box"; an item that can be seen on the front starboard side of the 2nd class entrance on the boat deck of the Titanic, but is missing from photos on the same area of the Olympic. It moniker is well selected; the function of this box is unknown. There aren't main structural differences between the two ships on A deck; the obvious one is the inclusion of the screens with retractable glass windows which graced the forward of the promenade. At the front of the promenade, a screen and door prevented a gust from blowing down the deck, generated by the forward motion of the ship. Ismay's desire for more revenue is evident here; two 1st class cabins are added to the foyer area of the aft grand staircase. These two cabins were occupied by (later Father) Frank Browne during the Southampton to Queenstown leg of the journey; and by Titanic designer, Thomas Andrews. One of the most cited differences is the painting in the 1st class smoking room; "The Approach To The New World" on the Olympic, and "Plymouth Harbour" on the Titanic. Researcher Robert Read informs us that the smoking room flue was directed up through the fourth funnel on the Titanic, whereas on the Olympic it vented through a pipe. B deck shows the most differences between the two ships. Some of these (placings of vents and skylights on the forecastle) are fairly trivial, but most are extensive. The whole 1st class promande, reportedly underused on the Olympic, was now converted into staterooms; these included two so-called "parlour" suites with their own private promenades. The gangway "entrances" provide a temporary punctuation in the procession of these new cabins on B deck. Further aft, the 2nd class promenade is now truncated; previously, 2nd class passengers could peer in through the windows of the restaurant to see those in the upper class dining. Now, the promenade only extends around the 2nd class smoke room. The restaurant and associated pantry and galley were extended to the port side, while, on the starboard side, a brand new "Cafe Parisian" was added. The arrangement of portholes on the forward part of B deck wa different too. As can be seen below, the Olympics' were all rectangular but the Titanic's had circular ones too. 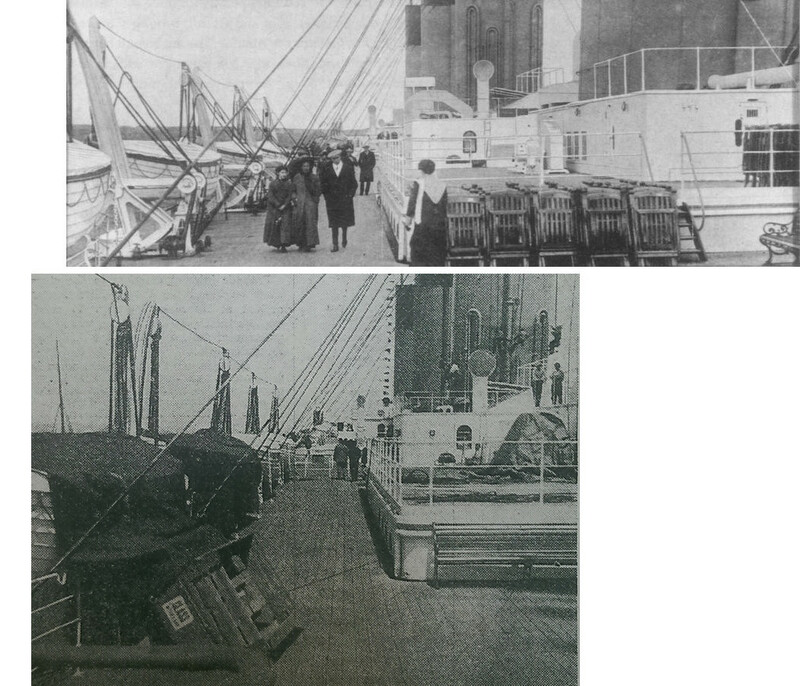 Left: a Booth family photograph of the Olympic from 1911; Right: the Titanic being prepared in Southampton for her maiden voyage. Click on the image for a larger version. A 25 inch diameter bell was located at the base of the foremast; on the Titanic, this was mounted on the rearside. The Olympic's was on the side facing forward. Both the Olympic and Titanic had a flue that extended from the forecastle deck and was mounted to the port side of the main mast; the top of the flue on the Titanic has a slight kink at the top, further separating it from the mast. Also on the forecastle, the arrangement of windlass valve handles was different on the two ships. The aft docking bridge also overhung the edge of the support structure on the Titanic; on the Olympic, it was flush with the struts connecting it to the poop deck. In late 1912, the Olympic was modified so that the bridge matched her late sister's configuration. Not much in the way of changes on C Deck; the cloakroom on the port side of the grand staircase is now two cabins. This "cloakroom" and adjoining cabins have been brought forward so that their forward faces are now flush with the corridor leading aft on the port side. 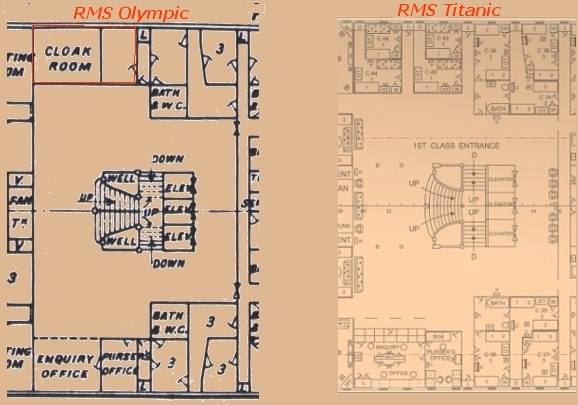 The Olympic's plans seem to indicate doors that lead aft; these do not seem to be apparent on the Titanic's plans. As pointed out by Steve Hall, the arrangement of ports at the stern were different and unlike those on the forward portside forecastle, the number never varied during the lifetime of the two ships. The area where the 1st class entrance vestibules open into the reception area is reduced in size on the Titanic, owing to the popularity of the latter. The ceiling panels (and lights?) are different, and several extra columns abreast of the grand staircase and forward of the elevators have been added according to a 2001 wreck dive report on Parks Stephenson's website. "Titanic : The Ship Magnificent" Volume 2 states that the elevator foyer's ceiling was the same pattern as the reception room, unlike the Olympic's, and the exterior grilles on the elevators were different too. The plans of the Olympic denote a 3rd class staircase that connected the port side entrance to the steerage area on E deck, directly below, thereby allowing them to enter the ship if necessary without intruding into 1st class areas. The Olympic also had signs denoting each deck unlike the Titanic, which had brass lettering facing the stairs; the Olympic was altered at some later point to conform to the Titanic's design. Behind the exterior shell plating gangway doors are retractable grilles on the Titanic, but the Olympic's plans show these to be hinged double doors. Although there are no obvious differences between E deck for the two ships, greaser Frederick Scott testified at the British Inquiry that the area on this deck from where he obtained his lifebelt could be found the post office on the Olympic, where he used to get stamps. 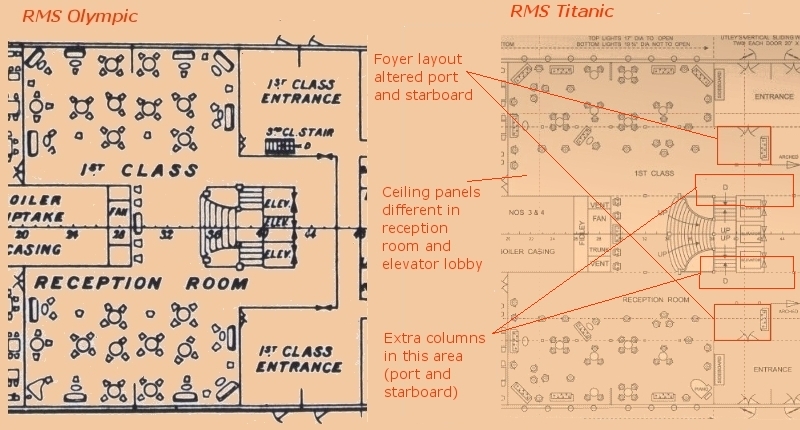 However, looking at the General Arrangement plan of the Titanic, no such room is obvious. The area of the Turkish bath on F deck were extensively modified. 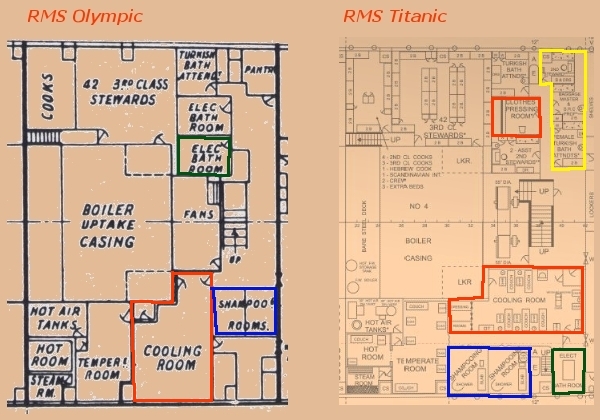 On the starboard side, the cooling room (in red) and shampoo room's (in blue) location and size were changed, and one of the electric bath rooms (green) was moved from its location on the Olympic (off to one side of the foundation of the forward 1st class grand staircase) to the starboard side, flush against the hull. The other electric bathroom seems to have been dispensed with. On the port side, the rooms closest to the staircase were altered; the two electric bath rooms now become a room for 2nd assistant stewards, and a clothes pressing room (in orange). Further to starboard, and facing these rooms, a pantry on the Olympic has now become expanded to being (from outboard in) a room for the 2nd steward, a room for the baggage master and the sports instructor for the squash racquet court, and then a separate room for the female Turkish bath attendants. I am unsure where these rooms were originally located on the Olympic; probably off the working alleyway on the port side of E deck? On G deck, the third class "open berths" on the Olympic are now separate cabins on the Titanic; these areas are compartment F, on the port side of the squash racquet court and the post office, and behind the area for 1st class baggage; and compartment D, which is forward of the Number 2 hatch. These areas are denoted in red above. In the comparison below (the top is the Titanic taken at Queenstown, the bottom is the Olympic pre-maiden voyage), the photos were taken from approximately the same location and height. As one can see, the pipes on the rear of the Titanic's 3rd funnel extend higher than those of the Olympic. You might also be interested in the Titanic Switch website.